How about insalata caprese for dessert? 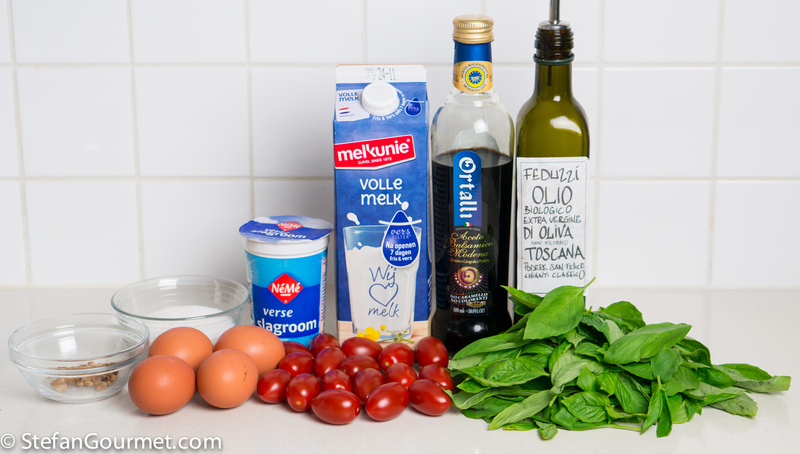 Most of us love the famous combination of tomato, buffalo mozzarella, and basil as a savory dish. 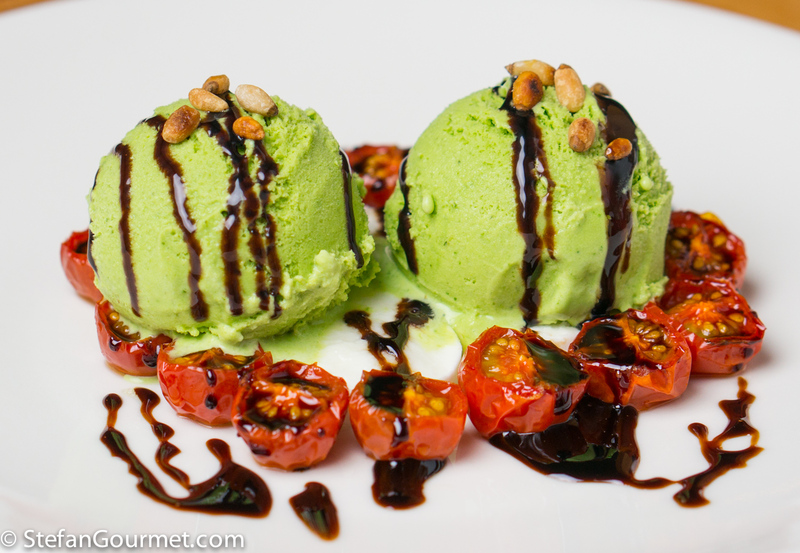 But it is also delicious as a dessert with the basil transformed into ice cream. 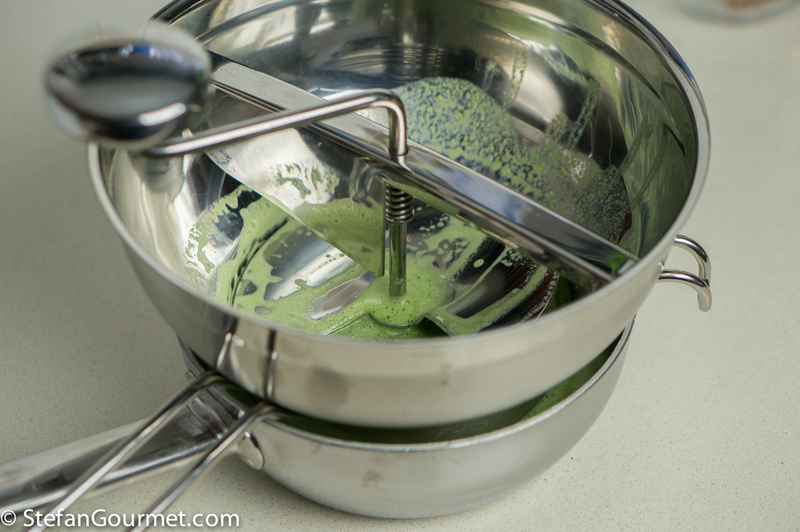 The technique for making basil ice cream is the same as for making mint ice cream. Cherry tomatoes are roasted in the oven to bring out their sweetness (with a bit of sugar added for good measure). The buffalo mozzarella just needs to be served at room temperature to bring out its flavor. Balsamic vinegar is not a good idea on the savory version of insalata caprese (because it would overpower the other flavors), but a balsamic syrup is great when drizzled on top of this. As a finishing touch, a drizzle of the best extra virgin olive oil you can afford. And some toasted pine kernels. What’s not to love? 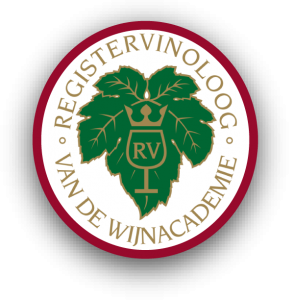 A note on the balsamic vinegar: if you can find it, it is best to use balsamic vinegar without caramel used for coloring. 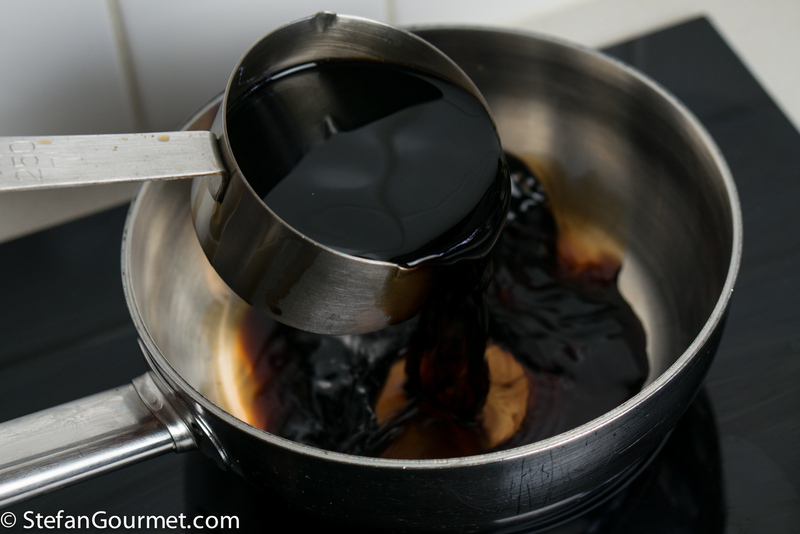 Many producers add caramel to their balsamic vinegar to make it look more like the expensive aceto balsamico tradizionale (which has to be aged for at least 12 years). 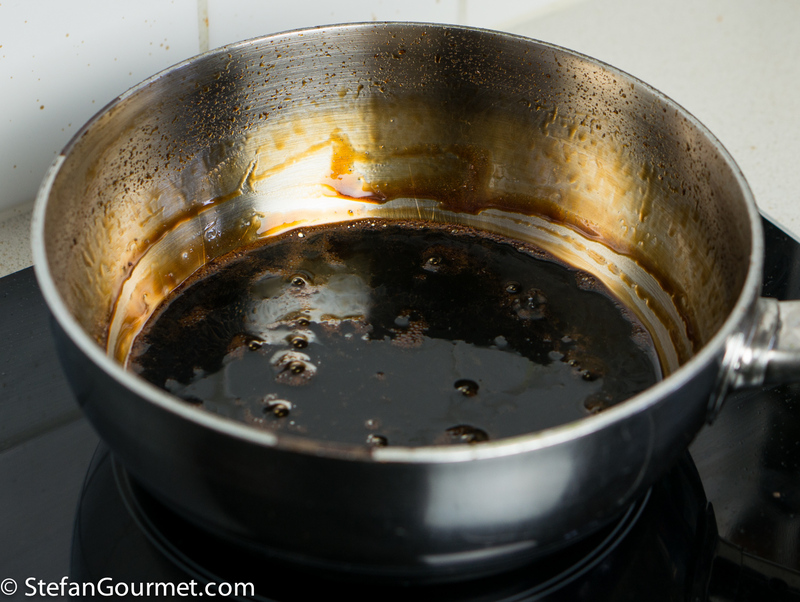 When you reduce the balsamic to make a syrup, the caramel will give an unpleasant burnt taste. Wash and dry 50 grams of basil leaves. 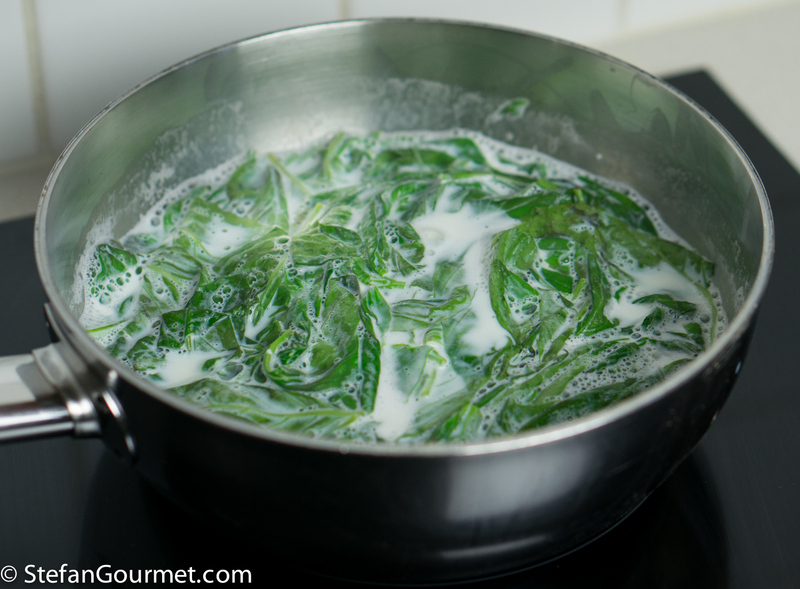 Put them in a saucepan, and cover with 375 ml (1 1/2 cups) of whole milk. …and bring to a boil. 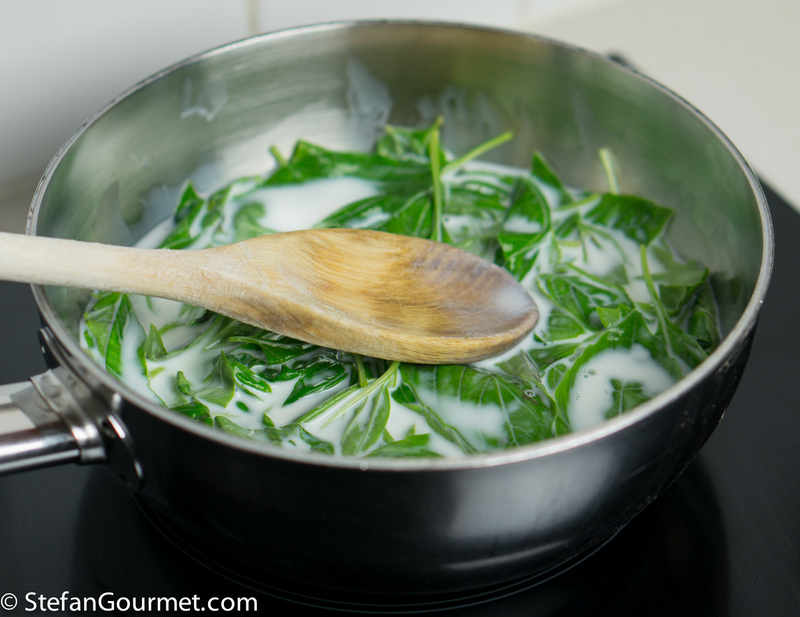 Turn off the heat as soon as the milk starts to boil, then turn off the heat and allow to steep for 10 minutes. 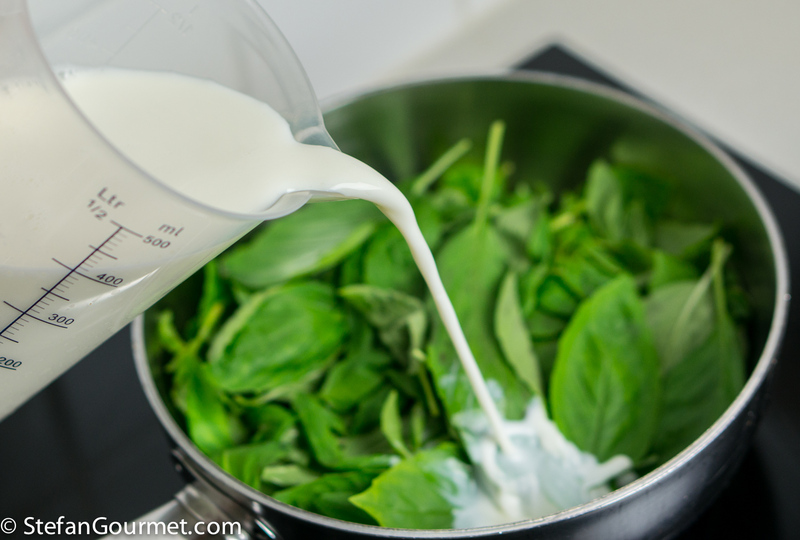 After those 10 minutes, transfer the milk and basil to a blender and blend on high speed until very smooth. 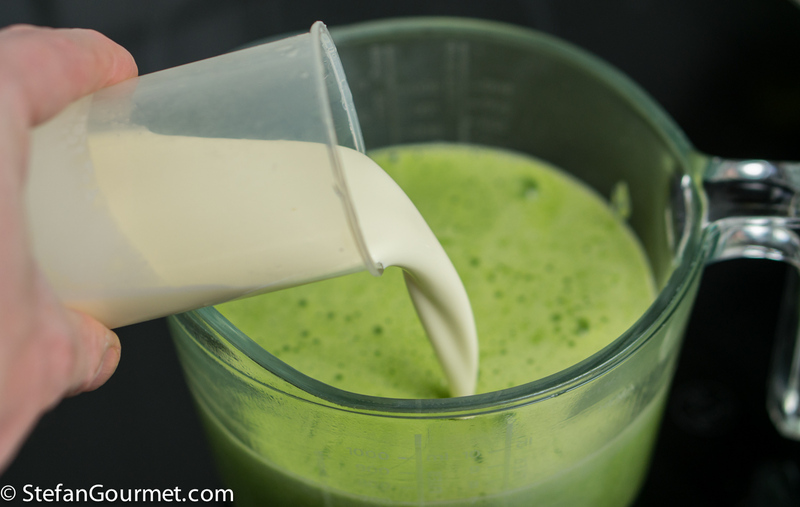 …to strain the basil-infused milk. 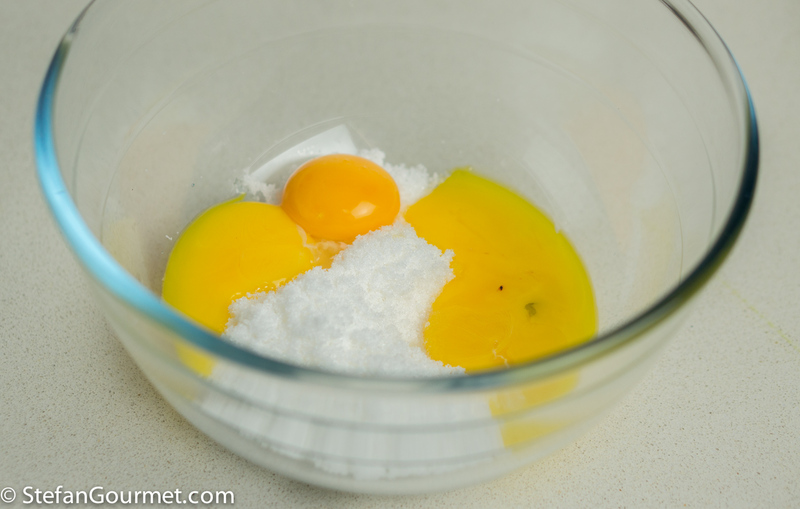 Combine 100 grams (1/2 cup) sugar in a bowl with 4 egg yolks. 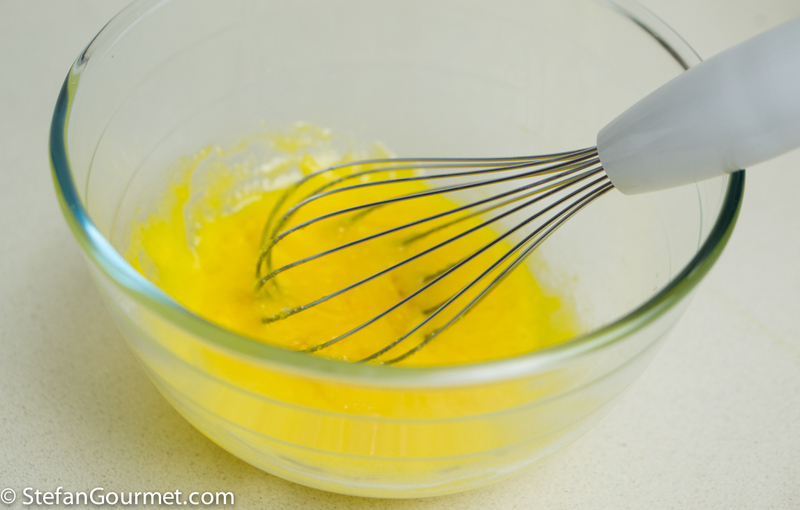 Whisk the egg yolks and the sugar. 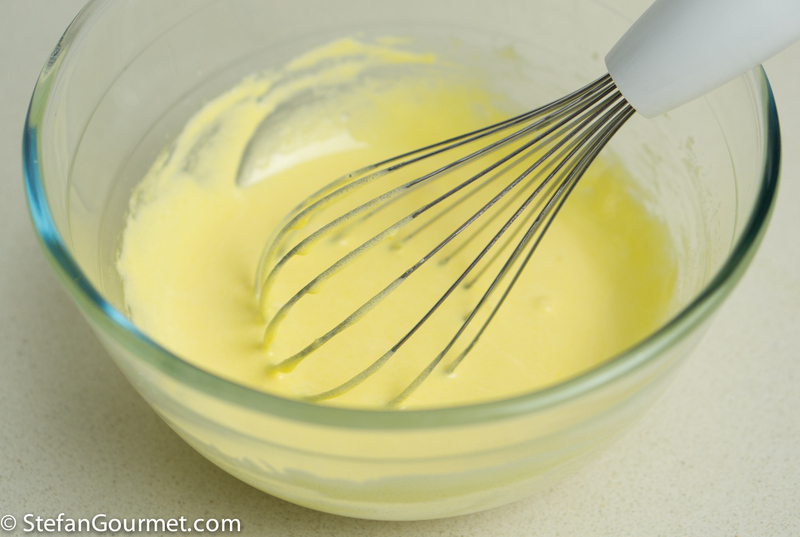 Keep whisking until the mixture becomes pale. 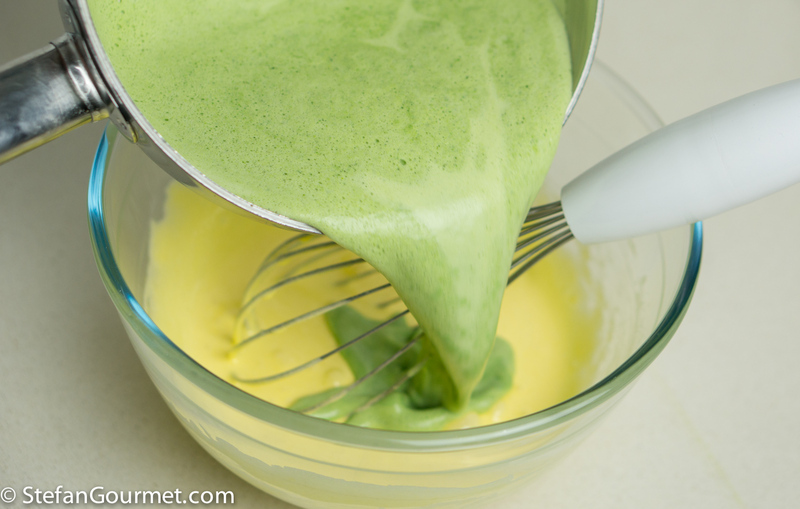 Now add the basil-infused milk to the egg yolk and sugar mixture, and whisk to mix. Heat to about 85C/185F over medium high heat, while stirring constantly. 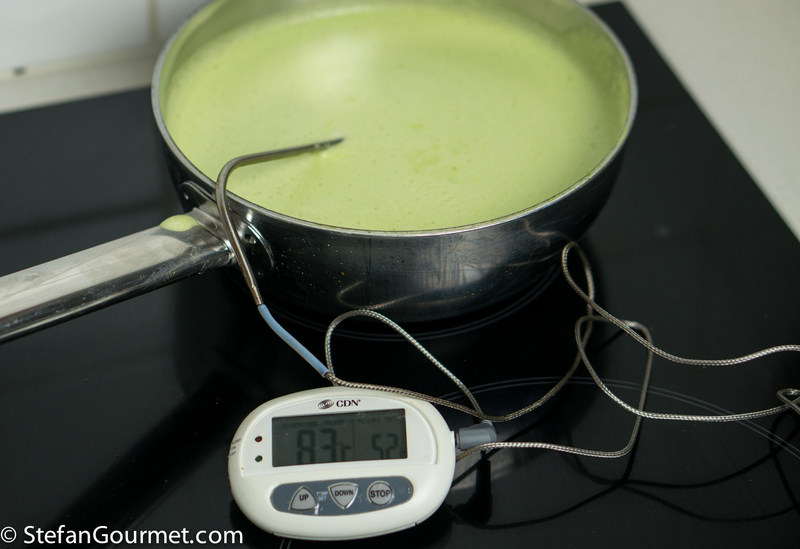 I like to use a thermometer with a probe, as it allows me to heat the mixture quickly without the risk of bringing it to a boil (we don’t want that to happen as the eggs would curdle). 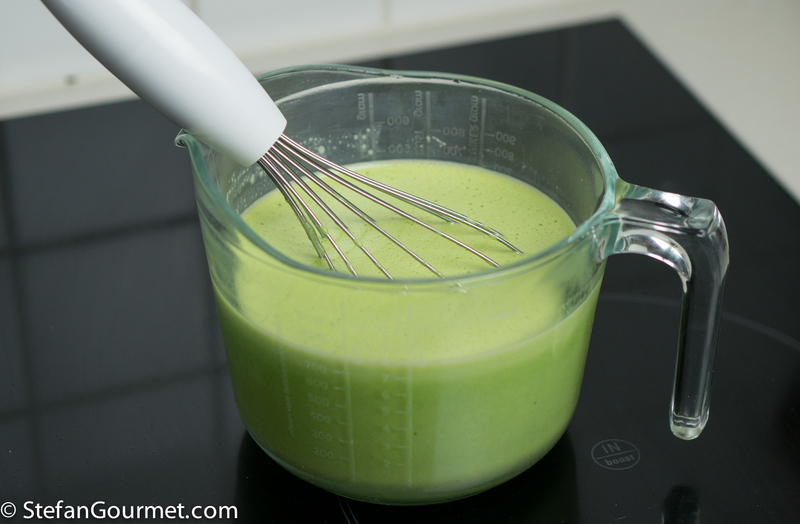 If you don’t use a thermometer, you could also stir over medium low heat until the mixture coats the back of the spoon. That will take a lot longer and I am not a very patient person. 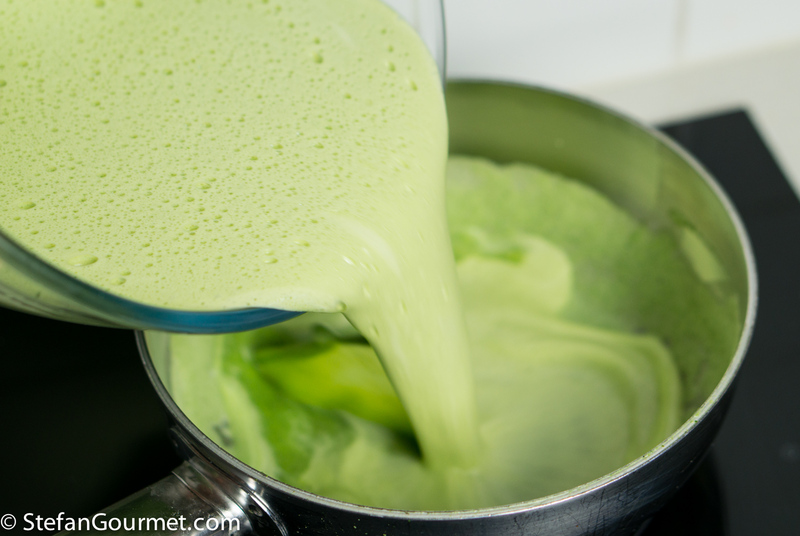 Transfer the mixture to a bowl or jug and add 125 ml (1/2 cup) of heavy cream. 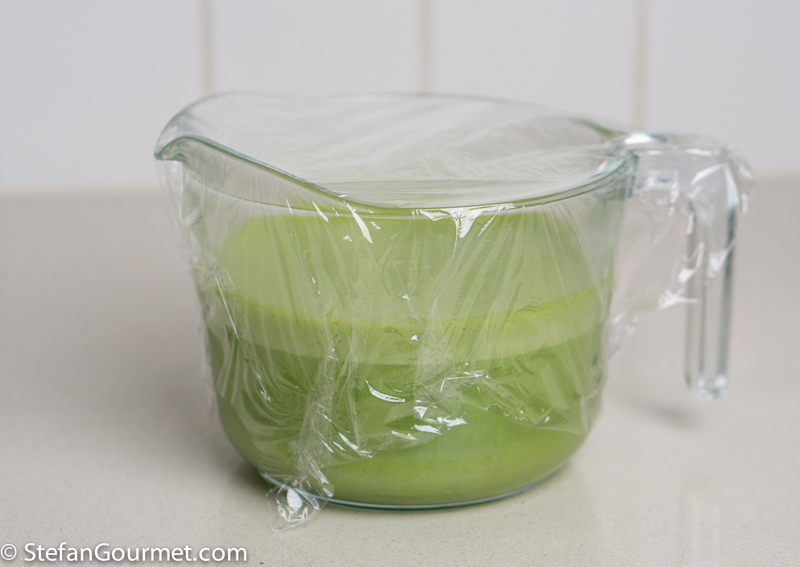 Cover with plastic wrap and refrigerate until the mixture is completely cold. As soon as it is cold, churn in your ice cream maker according to the manufacturer’s instructions. Transfer the ice cream to a container and put it in the freezer to harden. Preheat the oven to 160C/325F. Cut 250 grams (.55 lb) of cherry tomatoes in half. Lightly oil an oven proof dish. Arrange the cherry tomatoes in a single layer, cut side up, and sprinkle with a tablespoon of sugar. Roast the tomatoes for half an hour at 160C/325F. Afterwards, take them out of the oven and allow to cool to room temperature. 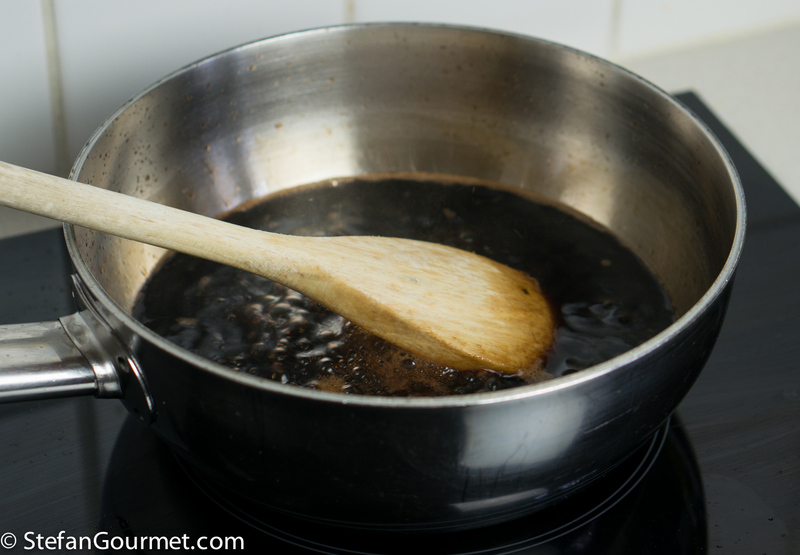 To make the balsamic syrup, pour 250 ml (1 cup) balsamic vinegar into a saucepan. 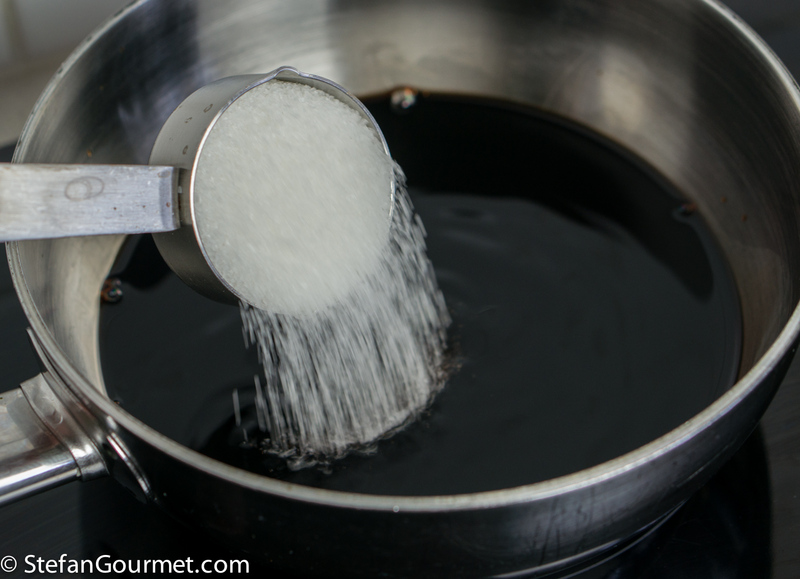 Add 50 grams (1/4 cup) of sugar. Bring to a boil, stirring, then reduce the heat to a simmer. Put the ice cream in the refrigerator for half an hour before serving, so the ice cream can soften a bit. Arrange mozzarella, tomatoes, and ice cream on serving dishes, and drizzle with the balsamic syrup and extra virgin olive oil. Garnish with the pine kernels and serve at once (before the ice melts). This is nice with Brachetto d’Aqui, the red cousin of Moscato d’Asti. If you can’t find it, regular Moscato d’Asti will do in a pinch. 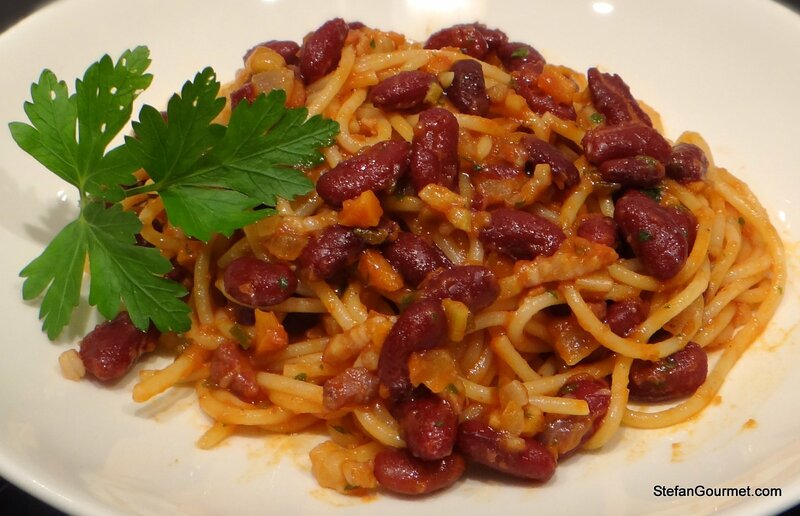 Pasta with stewed kidney beans is a hearty flavorful dish, perfect for winter. Love insalata caprese and have to put my ‘no dessert’ rule on the backburner for this beauty! Very inventive and beautifully presented . . . Thanks for the tip about caramel coloring. 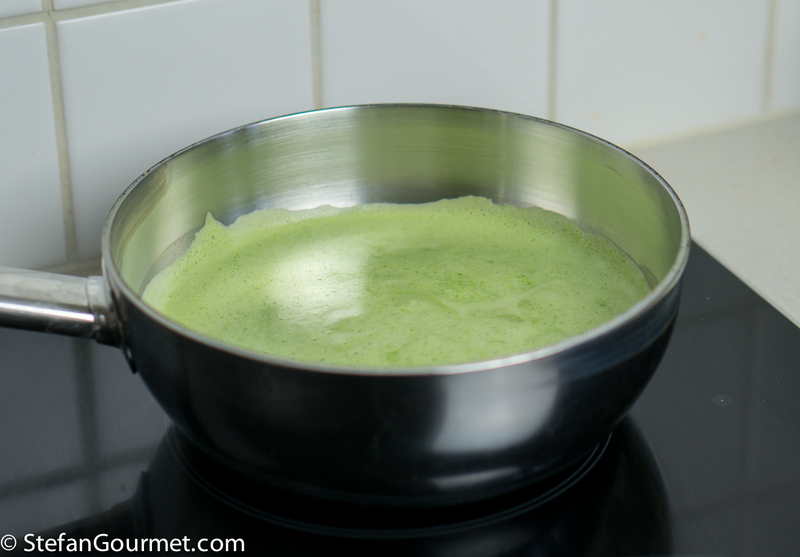 I love basil ice cream, but I’ve never made it. I do make mint ice, cream, but I never thought to puree it before straining it. So I guess I leaned a lot from this! Very inventive Stefan. I am struggling with it as dessert. 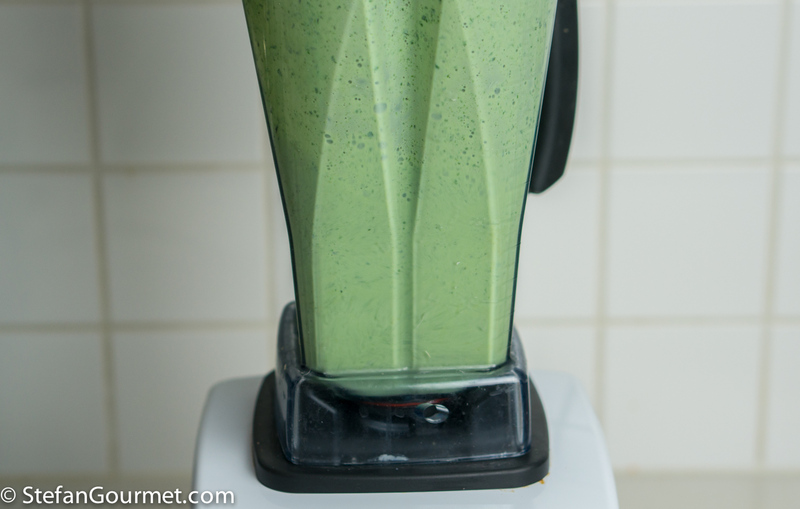 A cheat I use: work the basil (leaves only) into a tub of store-bought vanilla ice cream using a handheld blender. Once blended in, I return the ice cream to the freezer to firm back up. Lap time to go from vanilla to basil ice cream: About 2 minutes. This works because many commercial ice creams contain gums and stabilizers that ensure quality is maintained when repeatedly (partially) defrosting and refreezing, as might happen in a busy supermarket setting. This cheat permits quickly experiments with many interesting “grown up” flavours, as long as they combine well with the base flavour of the ice cream – try vanilla or chocolate with coffee, chocolate/orange/stem ginger, vanilla/cardamom or vanilla/mustard. That’s interesting. One of the reasons for making your own ice cream though is to get rid of gums and stabilizers. But it certainly is nice to experiment whether a ‘grown up’ flavor will work as ice cream.